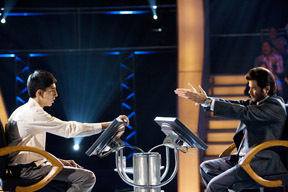 Dev Patel is in the hot seat opposite Anil Kapoor in Slumdog Millionaire. Starring Dev Patel and Freida Pinto. Directed by Danny Boyle. Written by Simon Beaufoy, based on Vikas Swarup�s novel. Rated R.
The Indian game-show drama Slumdog Millionaire takes the top prize. I had an opening paragraph all ready to go for my review of Slumdog Millionaire, saying how all the hype about India as a burgeoning superpower was premature until the country faced up to some serious internal social problems. Then that same point was driven home to the entire world by those obscene terrorist attacks on Mumbai last month. So I junked that idea. What can a mere film critic say after that? Well, I can say this: It may be scant consolation at such a terrible time, but the people of Mumbai love their movies, and they�ll be proud to know that this throbbing love letter to their city is the most exhilarating film of 2008. Based on Vikas Swarup�s novel Q&A, the movie stars Dev Patel as Jamal Malik, a teenage contestant on the Indian version of Who Wants to Be a Millionaire? An orphaned street kid who works the lowly job of chaiwalla � serving tea to the desk-bound operators at a call center � Jamal is now one question away from winning the top prize of 20 million rupees (around $450,000 based on the exchange rate in 2006, when the story takes place). During a break in the taping of the show, he should be on top of the world, but instead he�s at a police station being tortured by the cops, who think he obtained the correct answers by cheating. How else could this uneducated �slumdog� know whose portrait is on the American $100 bill, when he doesn�t even know who�s pictured on the 1,000-rupee note? (It�s Gandhi, if you�re wondering.) The film is structured as a series of flashbacks, as Jamal recounts his life story to the lead detective (Irrfan Khan), explaining how his poverty-stricken existence gave him the specific knowledge to answer each of the dozen or so Millionaire questions he�s gotten right. Some British expertise helps create this Indian masterpiece. The mostly English-language DELETE is by The Full Monty screenwriter Simon Beaufoy, and the virtuoso style of director Danny Boyle gives this work an unstoppable momentum. His camera flies through the streets of Mumbai, showing a younger Jamal and his protective older brother, Salim (the pair played by two different sets of kid actors at different times), as they run from the cops, run from the gangsters, run to earn money, run to get an autograph from movie star Amitabh Bachchan, and run just because they�re little kids. Cinematographer Anthony Dod Mantle fills the screen with rioting colors, and composer A.R. Rahman lays tasty modern Indian grooves (including M.I.A.�s �Paper Planes�) on the soundtrack that add to the headlong rush of this film. They help make this Boyle�s finest work, no small achievement for the director of Trainspotting and 28 Days Later. Boyle can play it cool with as much skill as he plays it hot, and so he does in a delectable romantic subplot between Jamal and Latika (Freida Pinto), a girl he grew up with. The British-born Patel is a shade too polished for his character, but he�s excellent at portraying the raw passion that drives Jamal to save Latika from her life as a gangster�s moll. The director also milks the slow-burning game show sequences for all the nerve-frying tension they�re worth, even though we know Jamal has the right answers. The oily, condescending Millionaire host (Anil Kapoor) becomes a fascinating figure of derision, his jovial smile growing tighter and more forced as Jamal gets closer to the big prize. Though the plot is riddled with improbable coincidences, the movie blows past them with sheer dynamicism and verve. One reason the filmmakers are credible is that they don�t shrink from the ugliness and squalor while following Jamal and Salim through the layers of Mumbai society. Most Indian films depict slums by building them on studio backlots, but Boyle and his credited co-director, Loveleen Tandan (who translated the Hindi parts of the DELETE and facilitated the filming in India), shoot their scenes on the actual streets of Mumbai, giving the movie an irreplaceable authenticity. Police corruption, religious violence, enforced prostitution, and filth are on display everywhere, even in the flush of Mumbai�s recent economic boom. We see a soulless crime boss (Ankur Vikal) scoop out the eyeballs of one of the boys who panhandles for him, because blind street beggars earn more money. Some might object that the suffering of desperately poor people shouldn�t be used to entertain middle-class moviegoers. To which I say that high-minded message films don�t seem to work any better to alert those same moviegoers about the plight of the poor. Shiny surfaces and redemptive storylines are often used to sanitize poverty, but this movie�s visual beauty and its story about Jamal�s amazing run of luck serves to draw attention to the deprivation around him. Much like in Fernando Meirelles� City of God, the film�s visceral thrills make the contemplation of its society�s inequities bearable. The movie ends with a dance number filmed in Victoria (or Chhatrapati Shivaji) Terminus, a train station where dozens were slaughtered on Nov. 26. The terrorists left their mark on that famous place, but even they couldn�t mar the bounding exuberance of that final number and the rest of Slumdog Millionaire, now a testament to the vitality of Mumbaikars. It makes you want to dance, too, and what�s better than that?